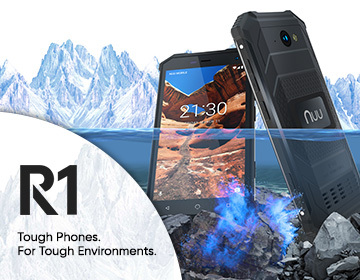 NUU Mobile, a global manufacturer and supplier of unlocked smartphones, today announced the launch of the new G1. The new unlocked, dual SIM smartphone features a long-lasting battery, and the latest Android operating system, Android Oreo (Go edition). The G1 is currently available on NUU Mobile’s website and on Amazon for $99.99. For budget-savvy holiday shoppers, NUU Mobile has partnered with Mint Mobile to include a Mint Mobile SIM card and three months of complimentary wireless service, including unlimited talk to all of North America (U.S., Mexico, and Canada), unlimited text and 5 GB of 4G LTE data per month, with each purchase of the G1 smartphone. This limited-time offer also includes a free case, and free, two-day shipping via FedEx. This special promotion is available today through Cyber Monday, November 26th, for only $79.99, exclusively on the NUU Mobile website. That’s combined savings of more than $75 for this Black Friday special! The G1 provides a powerful user experience, and the new and reimagined Android Go apps offer more storage, better performance, and enhanced data security. Additionally, the 5,000 mAh polymer battery ensures the G1 can run longer than a day, even if users are simultaneously playing games, making calls, texting, shooting videos or taking photos. The G1 is powered by a 1.3 gHz quad-core processor from MediaTek, and also features front-and-back cameras, dual SIM card capability (4G LTE on GSM networks), a 5.7-inch screen with 18:9 resolution, and memory that’s expandable to 64 MB for a premium user experience. listen to music for 160 hours. The G1 is compatible with all GSM carriers such as T-Mobile, AT&T and other carriers that operate on those networks. To learn more or to get your own unlocked NUU Mobile G1, click here to visit Amazon, or here to purchase the special holiday bundle deal on NUUMobile.com. To learn more about NUU Mobile and the G1, please visit nuumobile.com.